Replace your boat's helm and the steering cable together with one of these kits. Rotary three-turn steering kit with a quick connect cable set up to cut down on installation time. This system works on most boats with power steering assist, inboards and small outboards under 50hp where a no-feedback system (NFB) isn't required. The kit includes 90° bezel kit, Safe-T QC helm, SSC62 quick connect cable. Steering wheel and link arm kits sold separately. Measure twice and order once! If you have already disposed of your old steering cables without first recording the cable's length, here is the Teleflex (now SeaStar Solutions) Guide to Measuring for Steering Cables. 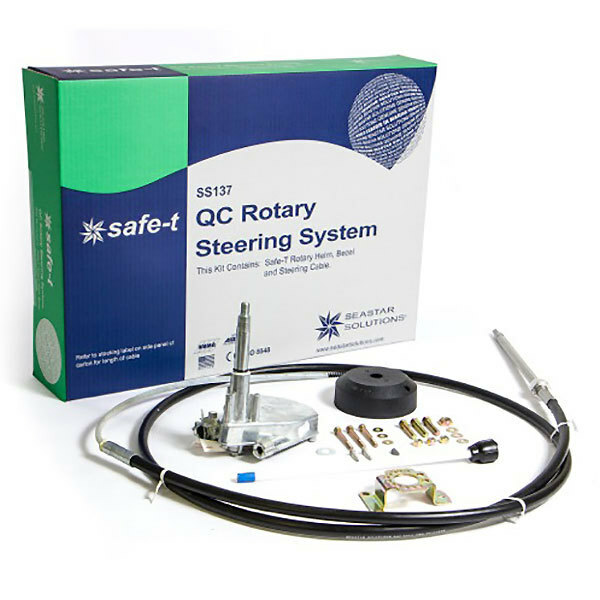 For an overview of included components, available options and dimensions, see the Safe-T QC Rotory Steering System. All SeaStar Solutions products carry a Two-Year Warranty.